The main event organized by Altaroma is AltaRomAltaModa, which coincides with the two annual appointments of Roman fashion week, in January and in July. Countless occasions for meetings between historic Italian fashion houses and new international creative and production realities. A week of appointments, not only runway shows but 'never-seen-before' unique locations at which to experience the unique synergy between design, art and fashion. 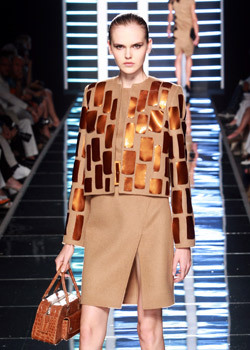 This year the presentation of the Fall-Winter 2011 Haute Couture collections started on 10th July and takes place until 14th July. 1. - 14. Models present creations by Italian designer Fausto Sarli during AltaRoma Fashion Week in Rome, Italy, 11 July 2010. 15. 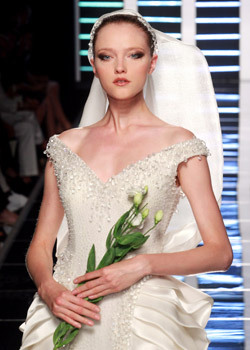 A model wears a proposal by Claudio Montians in the Complex of Santo Spirito in Sassia in Rome on 10 July 2010 during the opening day of AltaRoma high fashion week. 16. - 17. 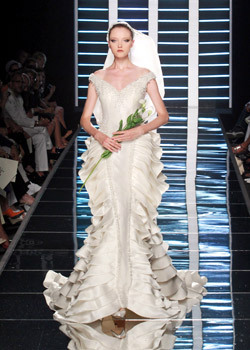 A model wears a proposal by erome C. Rosseau in the Complex of Santo Spirito in Sassia in Rome on 10 July 2010 during the opening day of AltaRoma high fashion week. 18. 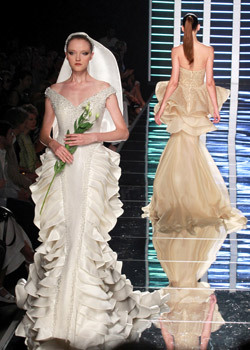 A model wears a proposal by Gail Sorronda in the Complex of Santo Spirito in Sassia in Rome on 10 July 2010 during the opening day of AltaRoma high fashion week.